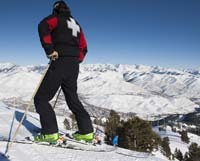 Ski Patrol: Sun Valley accident rate lowest in U.S. The National Ski Areas Association’s annual Safety Week will take place from Saturday, Jan. 19, through Sunday, Jan. 27, and Sun Valley Co. will launch several programs during the week to promote skier safety and respect for fellow shredders on both Bald and Dollar mountains. However, Dunn said that in the Ski Patrol’s eyes, every week is safety week. “Next week just serves as a reminder of that,” he said. Dunn said Safety Week at Sun Valley will feature some fun surprises on both Bald and Dollar mountains, including several snowmen holding safety signs “all around” the mountains and an old snowcat, also sporting safety signs, that will be on display at Dollar. Dunn said the Ski Patrol’s avalanche rescue dogs, Murphy, Syringa and Tucker, will be visiting the valley’s schools and will also be touring the mountains so people can pet and meet them. According to Dunn, the resort will promote several Ski Areas Association safety programs during the week, including Know the Code, which educates skiers on the association’s seven-part skier responsibility code, Lids on Kids, which promotes youth helmet use and Kids on Lifts, which teaches lift safety to youngsters. Dunn said about 80 percent of Sun Valley skiers currently use helmets. Dunn said the resort will launch a new program unique to Sun Valley this year called Be Chair Aware that will serve as an addition to Kids on Lifts. Dunn said program will teach kids how to load and unload from a chairlift safely using a practice chair—installed this season at Dollar—that is not connected to any lift. “We’ve decreased our misloads by 50 percent this year already,” Dunn said, attributing the reduction to the new practice chair. For those who want to save a few bucks while making sure their equipment is adjusted properly, the resort’s retail department will offer the Get Dialed In program, through which the resort’s sports shops will provide binding adjustment checks for half price, which is $15. “It’s a good time to make sure your equipment is safe and working properly,” Dunn said. Dunn said the Ski Areas Association recognized Sun Valley last year as having the best community outreach program of about 400 association member resorts. Dunn said the resort’s programs during last year’s Safety Week played a key role in that commendation. For more information on the resort’s Safety Week programs, visit the Ski Patrol’s website at www.svskipatrol.org or give the patrol a call at 622-6262.